N.E. Brigand: Trouble with your link... to the chapter's text on this post and the two that follow it. A domestic drama of Samwise and Sméagol. Gollum returned quietly . . . Sam came to him a moment later and found him chewing something and muttering to himself. On the ground beside him lay two small rabbits, which he was beginning to eye greedily. ‘Stew the rabbits!' squealed Gollum in dismay. . . . What for, silly hobbit? They are young, they are tender, they are nice. Eat them, eat them!’ He clawed at the nearest rabbit, already skinned and lying by the fire. ‘Gollum!’' he called softly. ‘Third time pays for all. I want some herbs.’ Gollum's head peeped out of the fern, but his looks were neither helpful nor friendly. ‘A few bay-leaves, some thyme and sage, will do - before the water boils,’' said Sam. squire: Today I would ask you to focus on Sam, treating Gollum objectively. That is why I have abbreviated some of the old noser’s lines. Later today we will re-consider this scene from Gollum’s point of view. A. How would you characterize Sam’s feelings for Gollum over the course of this little three-act play? What does Sam expect from Gollum? What drives Sam’s changing tone of address to Gollum? Dernwyn: A little civility Sam's got a meal of "normal" food on his mind. He's also got no way of procuring meat - but he does have an effective "meat-trapper" handy, so he's going to see how some civility works with Gollum. He starts off pleasantly enough, but his manner soon marks him as a master overseeing a miscreant servant: "I'll carve you into mincement" if pans are damaged sounds too harsh, and his "‘Sméagol’ll get into real true hot water, when this water boils, if he don't do as he's asked...Sam'll put his head in it, yes precious" is just over the top. But is this just Sam's normal manner of speaking with those "obviously" inferior to him? For right after this, his punitive speech itself "turns over a new leaf", with his offer of actually cooking a meal for Gollum! an seleichan: Tolkien's voice Has anyone else heard Tolkien reading this passage? I have it on a CD of recordings of both JRR and Christopher reading sections and poems from LOTR and other works. I love to hear the author read this section. Tolkien gives Sam (to my ear) an authentic rustic voice, and when you hear Tolkien read his words, it gives you insight into Sam a bit. First of all, it's as close as we can get to what Tolkien considered Sam to sound like when he wrote the words. When he says to Gollum, "What's more, if you turn over a new leaf, and keep it turned, I'll cook you some taters one of these days. I will: fried fish and chips served by S. Gamgee" he sounds like he really means it; he's not just wheedling Gollum into doing something, he's also bragging. And when he dismisses Gollum with the line: "Oh, you're hopeless...go to sleep", in Tolkien's voice it sounds like ordinary dismissiveness, a kind of bantering tone one might use in ordinary conversation. Quite interesting, to actually "hear" Sam talking to Gollum. Also: how anachronistic is "fish and chips" here, anyway? Merryk: I think you're right not to read too much venom into Sam's actual words. I have to feel it would be out of character for the mild-mannered Sam. It's nice to have evidence that the author didn't intend him to speak in "wicked witch" mode here. N.E. Brigand: Sam is testing Gollum a little, seeing how far he can be counted on, but without too much hope. He's being "practical," in the sense of getting from Gollum what he can. "I does ask...I begs," is an insincere bit of politeness but his later softness in asking Gollum to fetch herbs and his comments to Frodo indicate that Sam realizes he's pushed a bit too hard. Sam's been "in the moment," not thinking of Gollum's personal betterment. Would he someday cook an improved Gollum a fish and chips dinner? Sure! Is that likely? Sam isn't focusing on that question. His threats seem like ordinary kitchen talk, not too be taken seriously (Gollum isn't afraid of being boiled, though he probably doesn't appreciate the comment) with Gollum as scullery-boy. That Sam would use these joking threats suggests he's softened on Gollum. squire: B. Is Sam amused or regretful that he and Gollum don’t see eye to eye? Dernwyn: Considering Gollum's anti-Hobbit nature, Sam prefers to not have any traits associated with him. He's neither amused nor regretful about not seeing eye-to-eye with Gollum: he's pleased. FindingFrodo: Looking through Sam's eyes I've always gotten a little chuckle out of this, so I'll say "amused". ‘I wonder where that dratted Gollum is?’ thought Sam, as he crawled back into deeper shade. ‘He stands a fair chance of being spitted for an Orc, or of being roasted by the Yellow Face. But I fancy he'll look after himself.’ He lay down beside Frodo and began to doze. squire: C. How concerned is Sam for Gollum’s safety? Dernwyn: And he knows Gollum can take care of himself - heck, the thing's been wandering around for centuries, and he ain't dead yet. FindingFrodo: "Not at all" is the phrase that springs to mind. N.E. Brigand: Not much, but he'd feel some regret if Gollum were killed. Sam goes to war, and war comes to Sam. squire: D. Why does Sam speak as if he were in charge, and not Frodo? FindingFrodo: Well, Sam interrupts the ranger, pretending to take offense at being called not fair enough to be an elf, and then his mouth just keeps running on. Frodo lets him prattle on because he wants time to think, I'd wager. N.E. Brigand: He thinks it's his job to protect Frodo. He woke, thinking that he had heard horns blowing. He sat up . . . Sam thought that he heard cries and wild shouting also, but the sound was faint, as if it came out of some distant cave. Then presently the noise of fighting broke out near at hand, just above their hiding-place. He could hear plainly the ringing grate of steel on steel, the clang of sword on iron cap, the dull beat of blade on shield . . .
Sam, eager to see more, went now and joined the guards. He scrambled a little way up into one of the larger of the bay-trees. For a moment he caught a glimpse of swarthy men in red running down the slope some way off with green-clad warriors leaping after them . . .
squire: E. First they’re as near as he wants them, then he wants to see more? Were stories of fighting part of his fairy-tale education from Mr. Bilbo? Dernwyn: Sam's got that morbid curiosity most of us tend to have about physical conflicts: not too near, if you please, but I'd like to see what you're doing to each other. N.E. Brigand: He wants to see them from a safe distance. I've always wanted to see a tornado that way. At Weathertop, Sam recited some of "The Lay of Gil-galad," about the battle of the Last Alliance, so I'd say that he learned some tales of fighting, yes. squire: F. Is this train of thought Sam’s – or Tolkien’s? Where else does any soliloquy of this nature occur in LotR? Dernwyn: That soliloquy has "Tolkien" stamped all over it: the pacifist, who understands the need for war, but detests its results. I've often wondered if this was based on a real-life experience of his. FindingFrodo: Well, I think one can certainly make a case for this being Sam's or Tolkien's thoughts, or even that Sam is Tolkien or vice versa. But it occurred to me that Sam is seeing in the dead soldier. Not necessarily that he felt lied to or threatened, but certainly that he would rather have stayed home in peace, and didn't want to end up dead. N.E. Brigand: Doesn't Bilbo have some similar thoughts (to Sam's dismay at battle) about The Battle of Five Armies in The Hobbit? As for the thoughts about the dead man and his background, doesn't Pippin wonder about the Rohirrim and what sort of people they are as he's being carried by the Orcs? N.E. Brigand: I've always like Cor Blok's Oliphaunt. Thanks for including it. To his astonishment and terror, and lasting delight, Sam saw a vast shape crash out of the trees and come careering down the slope. squire: G. Is this another “Ted Sandyman” moment? How many of these moments does Sam have? Have you ever had a moment like this? N.E. Brigand: By TS moment, are you referring to the fire in Sam's eyes in Moria? Or to an experience of the astonishing breadth and variety of the wilder world as a refutation to what Tolkien calls "a readiness to measure and sum up all things from a limited experience" (Letter #246)? 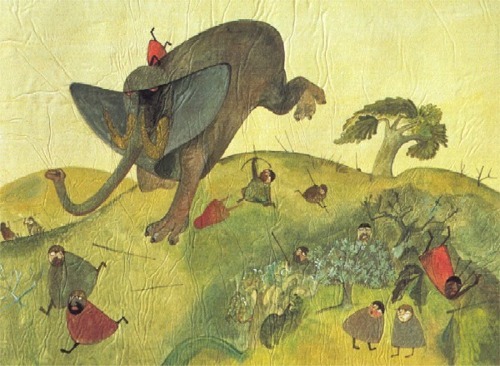 squire: H. Sam was almost crushed or impaled by a giant rampaging beast. How can he think immediately again of sleep? Dernwyn: Why does Sam want to sleep? Because the adrenaline rush is over - and with Faramir's men about, he doesn't have the need to make sure either himself or Frodo is standing guard. Sam – Summary for both posts. squire: Along with the passages discussed in these two posts, Sam also discovers the Orcs’ feasting grounds; argues with Gollum over lighting a fire, then allows it to smoke; hears the rangers’ whistle-signals; watches the camouflaged rangers creep up the slope; and casually dismisses his guards once the battle is over. I. If Frodo “wrote” the Red Book account of the War of the Ring, why is this chapter, in which he was a full participant, told so much from Sam’s point of view? Or, why does Tolkien make Sam the center of so much of the action in this entire chapter? N.E. Brigand: Another case where the textual history of the LotR isn't as clear as Tolkien sometimes pretends? After the Fellowship breaks, Sam has the preponderence of this half of the story's point-of-view. Textually, we must assume that Frodo listened closely to Sam's after-the-fact accounts, or that the book was modified by Sam. Nerdanel_50: Point of view I think the fact that this portion of the book, from here to Mt Doom, really, is all supposed to be written by Frodo. The fact that Sam is the central and most active figure shows that Sam is not the author--he would focus entirely on Frodo. With the benefit of hindsight, Frodo is building Sam up to make him the hero of the tale.